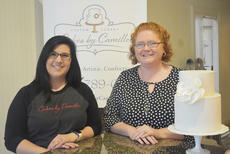 Shanon Camille O’Banion, left, and Andrea Harmon from Cakes by Camille on East Main Street in Campbellsville will be featured in an episode of the Food Network program “Winner Cake All.” The episode featuring O’Banion and Harmon is scheduled to premier Monday night at 10 p.m. on the Food Network. 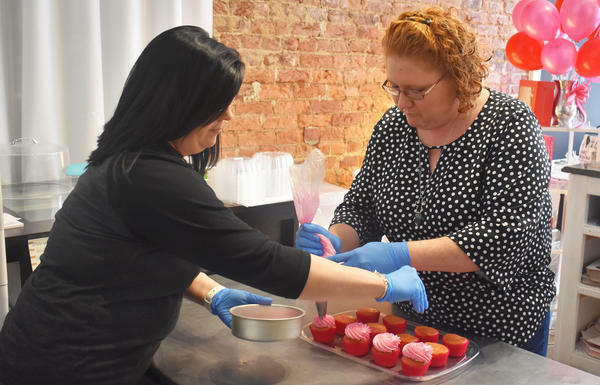 Shanon Camille O’Banion, left, and Andrea Harmon decorate cupcakes at their shop on East Main Street in Campbellsville. A Main Street business will be hitting national television airwaves Monday night. Owner Shanon Camille O’Banion and Andrea Harmon were featured on the show. Their episode will air at 10 p.m. on Monday, Feb. 4. They will be hosting a watch party at the store that night, beginning at 8 p.m.
“And there will be cake,” Harmon added. It all started with an unexpected phone call one day more than a year ago. It wasn’t a joke after all. Producers from the network discovered Cakes by Camille through social media and liked what they saw. Next up were a couple rounds of interviews and then a “cake challenge” at the shop, which ultimately led to them being asked to travel to California in October for six days to appear on the show airing on Monday. O’Banion and Harmon said they were elated to get the chance to showcase their talents for a national audience. The premise of the show, which has already aired a few episodes, involves four teams of two people each, similar to “Cake Wars” or “Cupcake Wars,” in which the teams compete for a cash prize. Harmon said that she is interested to see how the show comes together, but she said she is confident in their performance. “There is a little nervousness of how it will turn out, but I am proud of what we did while we were there,” Harmon said. The most complicated part, O’Banion said, was working out scheduling. “You’re talking about several bakers who all have events,” she said. O’Banion said one of the more rewarding aspects of the experience was meeting bakers from across the country. O’Banion said she also hopes that their appearance on the show will ultimately be beneficial to their business. “To be considered among the best in the nation, that is a huge honor,” Harmon added. O’Banion and Harmon have used Facebook to spread the word about their journey to landing a spot on the show, and they said that the local community and their customers have been extremely supportive throughout the process.